LEOPHIL is a premium knitwear and accessory design label based in Sydney Australia and founded by Valerie Jantz. The designs are an expression of the passion for beautiful and well made clothes and the love for natural fibres. Explorative, thoughtful and always with a keen eye for details - LEOPHIL joins a modern aesthetic with playful elements and a laid-back, effortless feel. Street style elements are mixed with a feminine elegance and colour plays an important role in capturing the essence of an inspiration or mood in each collection. LEOPHIL likes subtle changes and shifts to classic designs with an understated coolness. Every design and choice of raw material is based on a deep understanding of the importance of touch and feel of a product and its longevity. Designed with love and wisdom for people with a sophisticated approach to fashion. At the age of six, Valerie got her hands on a pair of knitting needles and never stopped creating since then. Born into a family of Swiss artisans, creativity was second nature and being surrounded by beautiful objects, collectibles and material always inspired her to create beautiful things herself. After a degree in Millinery and finishing her Bachelor in Arts and Design, she spent eight years in Fashion Styling, telling stories through images. After moving to Australia, the desire to go back to her roots and capture her creativity in a more tactile way laid the foundation for her label LEOPHIL. Her talent has been recognised with the Federal Swiss Design Award for her graduate collection "Just not big enough", oversized crocheted garments inspired by Artist Yoshitomo Nara. It also enabled her to train with Markus Huemer: Unit in New York and design duo DidierAngelo in Paris. 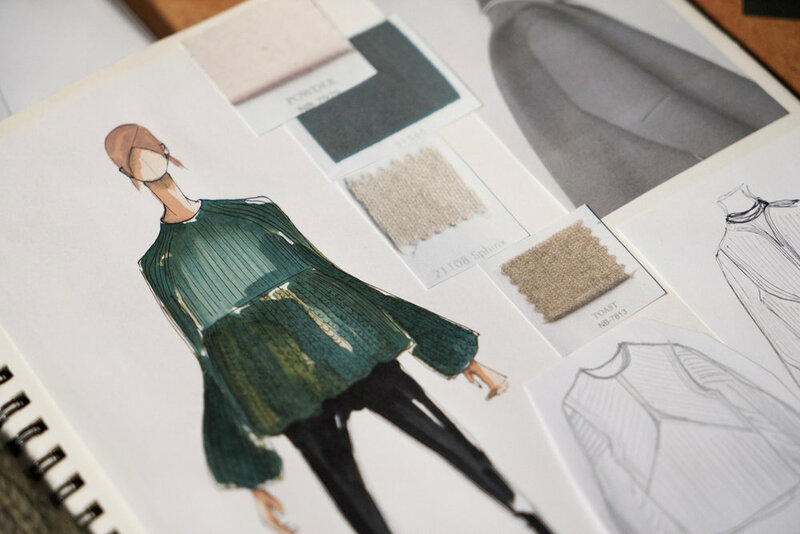 To create our knitwear, we work predominantly with noble fibres (100% natural fibres), as we believe in their outstanding performance, wearability and longevity. We like to work with more sustainable but nevertheless luxurious fibres such as Yak wool and we source our yarns from factories that are Oekotex certified and tested. For our accessories we source only the best qualities - like our hat straws and felts from Germany and Italy. From time to time we even get our hands on vintage stock - premium qualities and craftsmanship that can't be compared with today’s material. They are not only exceptional because of their quality but also due to their limited availability. All our hats are hand made in our Sydney studio. The scarves are designed, printed and finished in Australia. As a raw material we like to work with drapey silks, wools and cotton. We work hard on being as sustainable as possible. Our DHL shipping is therefore carbon neutral and we try to keep plastic packaging at a minimum. Please participate in caring for the environment and recycle all paper and cardboard packaging.